TAF 2009: Giveaway Goodies of ASTROBOY, Gurren Lagann, Fullmetal Alchemist, Umi Monogatari and more! 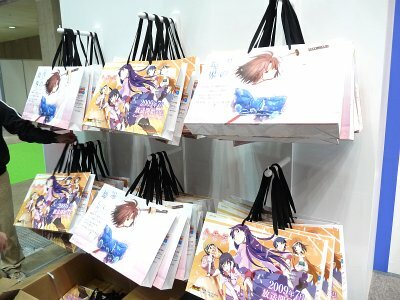 It's been weeks since Tokyo International Anime Fair 2009 concluded in huge success but we've still got some photos and materials from the fair, so this post will show you some examples of the splendid original products handed out at the fair, to further motivate you attending next year. 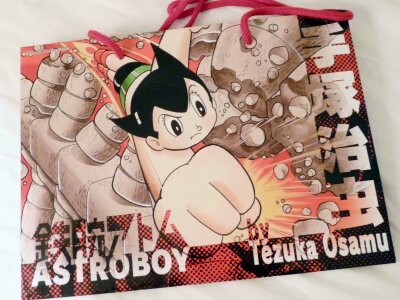 Astro Boy paper bag from Tezuka Productions' booth. Black Jack, Princess Knight, Phoenix and Kimba the White Lion featured on the flip side. 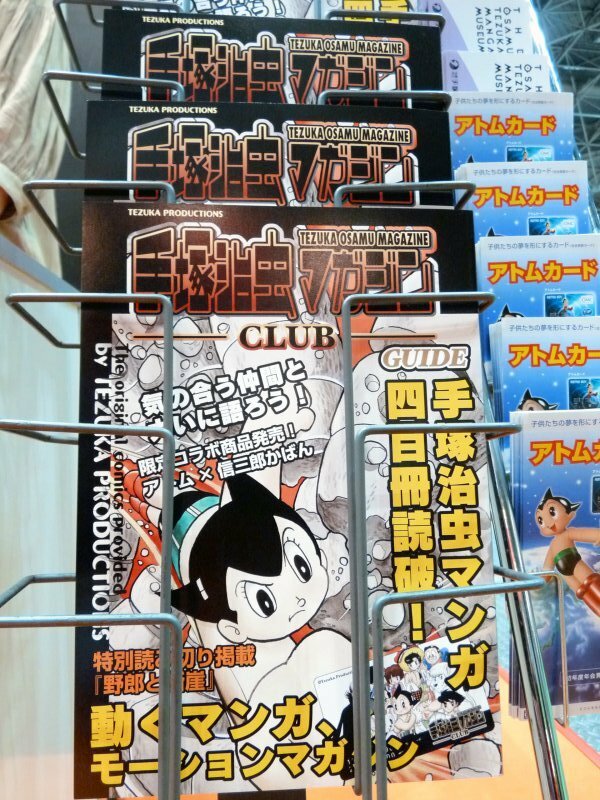 A booklet introducing the webzine Tezuka Osamu Magazine Club(Jp). 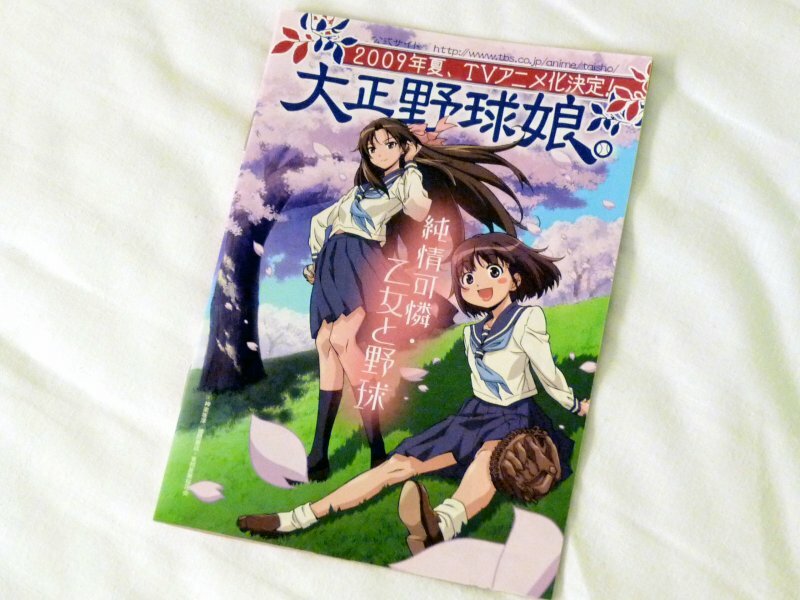 Contains a one-shot manga "Yaro to Dangai (Man and the cliff)" from anthology "Kuuki no soko (Bottom of the air)". 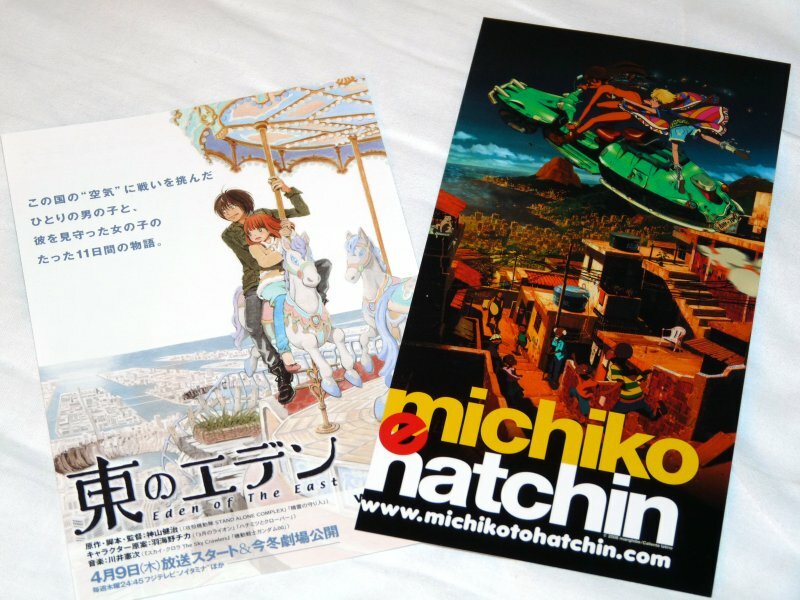 Fuji TV's booth was focused mainly on their noitaminA programming block and NOISE block, with leaflets and cards of Eden of the East and Michiko to Hatchin. 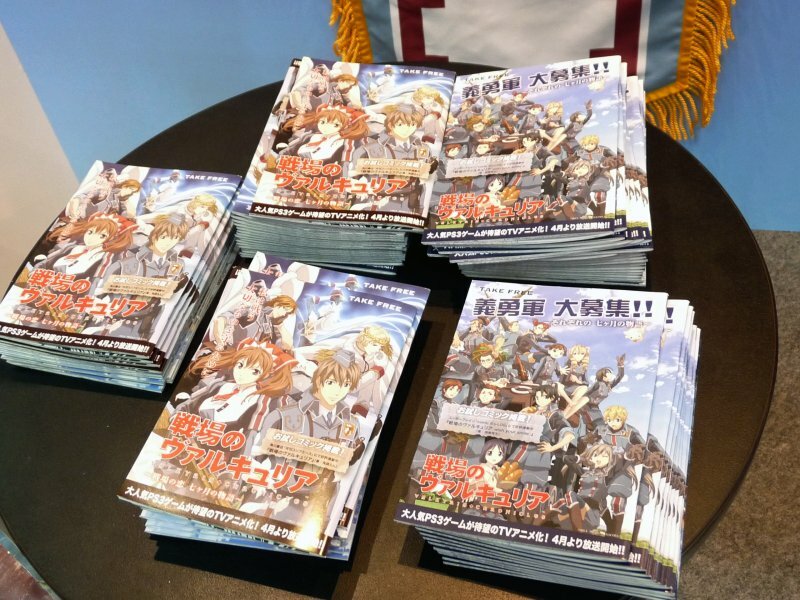 Booklet of Valkyria Chronicles's manga extract were distributed at Aniplex's booth. 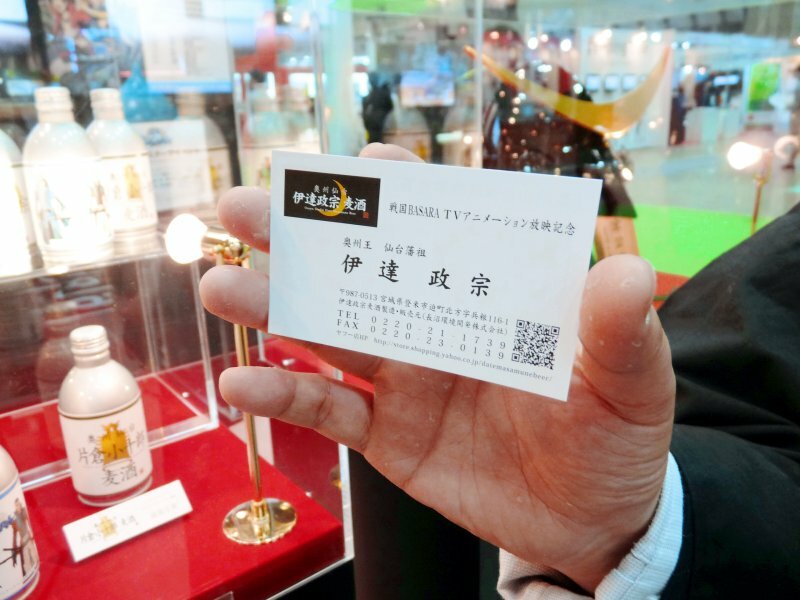 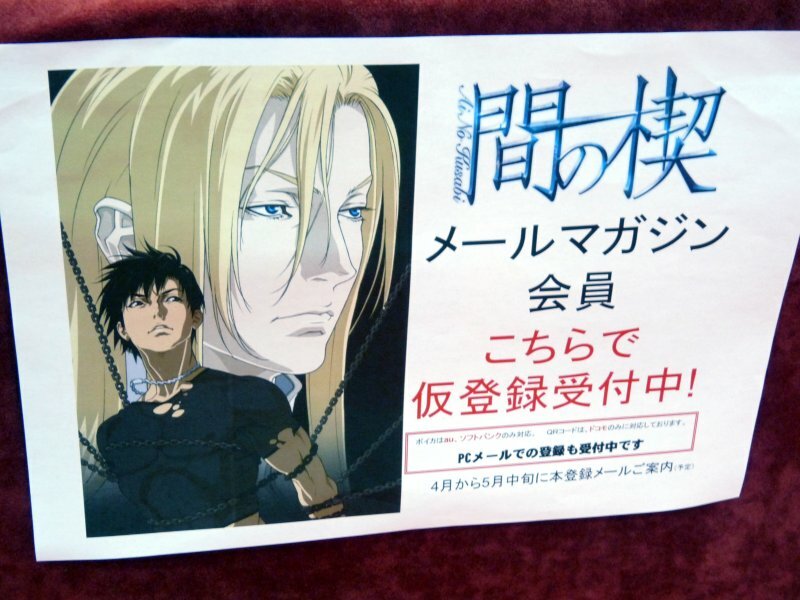 Subscription card for a mail magazine of Ai no Kusabi at Ken Media's booth. 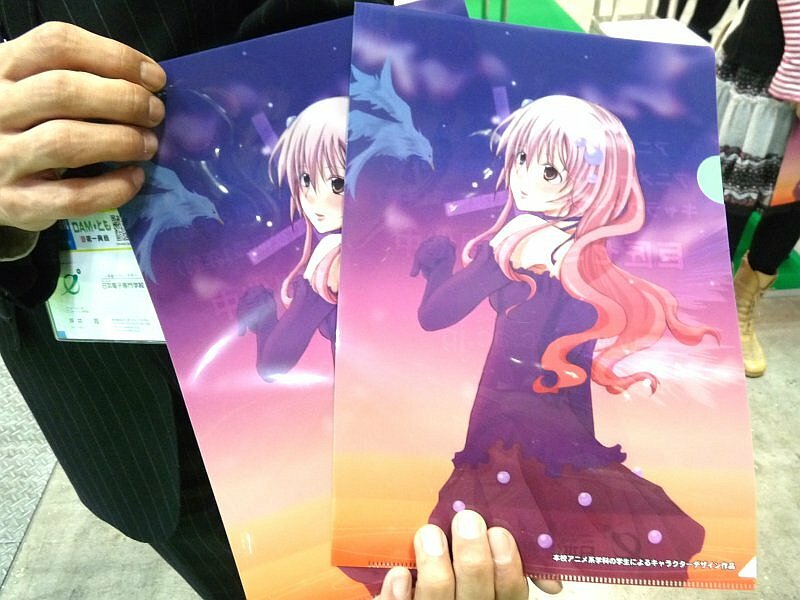 Character card of Shangri La from Kadokawa booth. 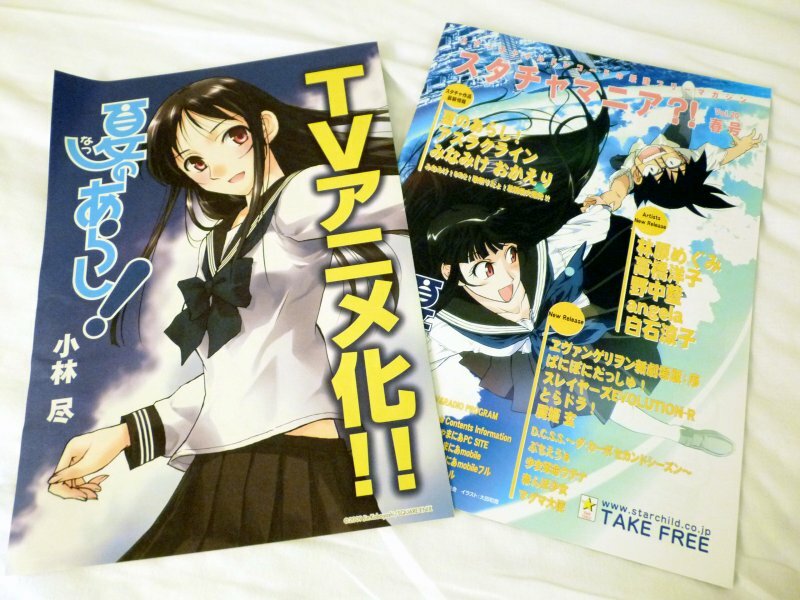 "Pos Maga", a free magazine which becomes a poster when spread out, at ASCII Media Works booth. 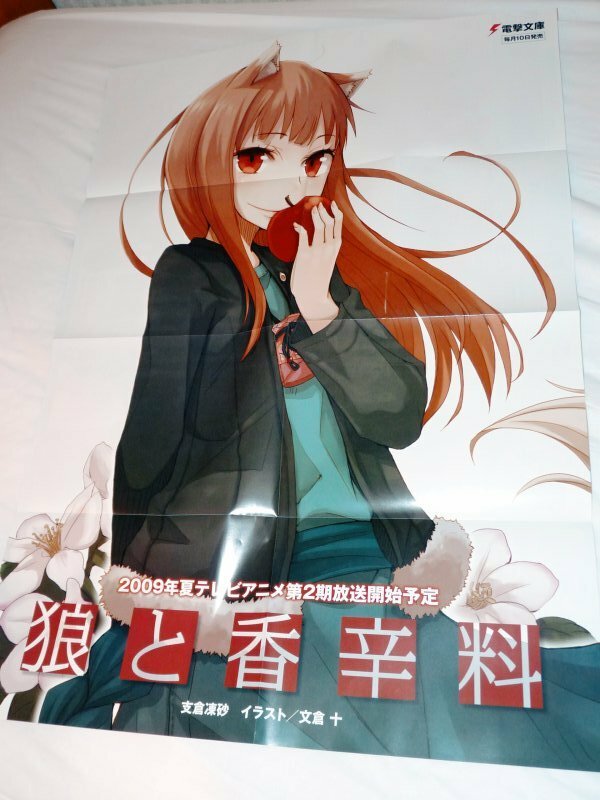 The poster side features Spice and Wolf. 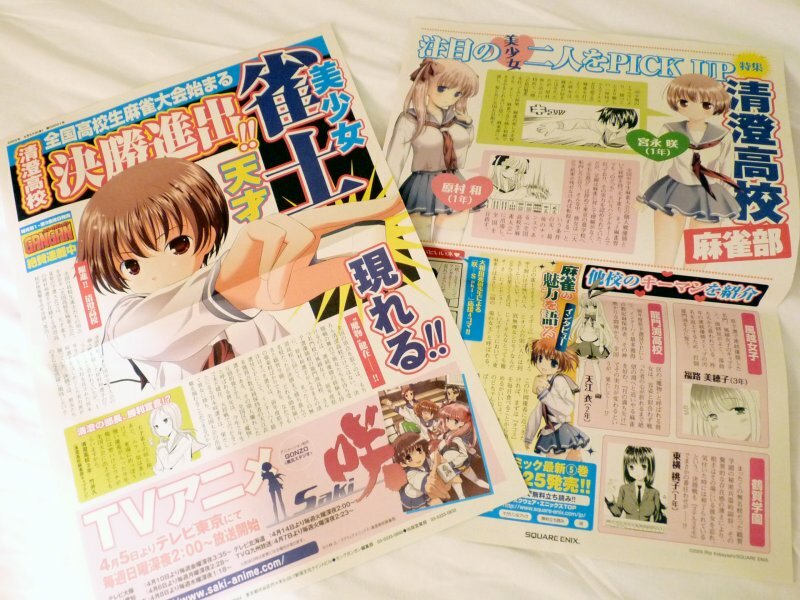 A mock-newspaper flyer of Saki handed out at Pony Canyon booth. 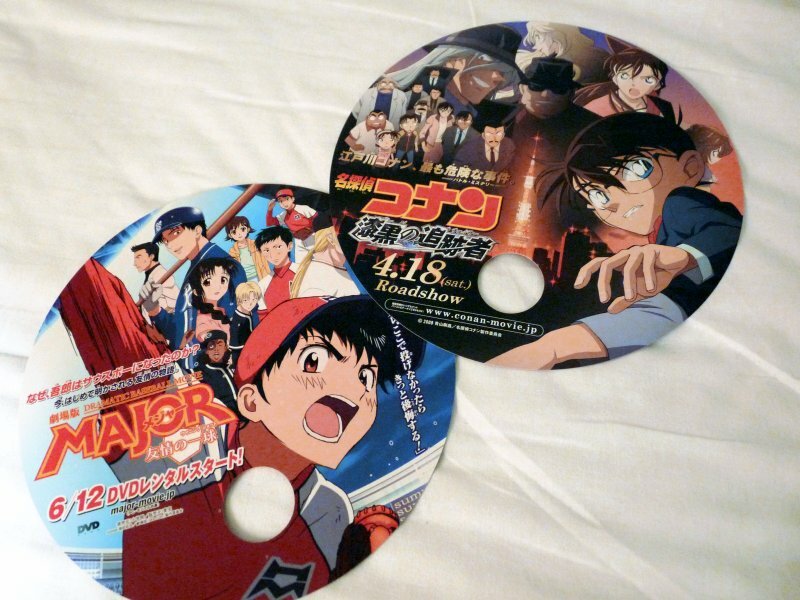 Paper fan featuring Case Closed: The Raven Chaser, with Major: Dramatic Baseball Movie on the flip-side, from Toho's booth. 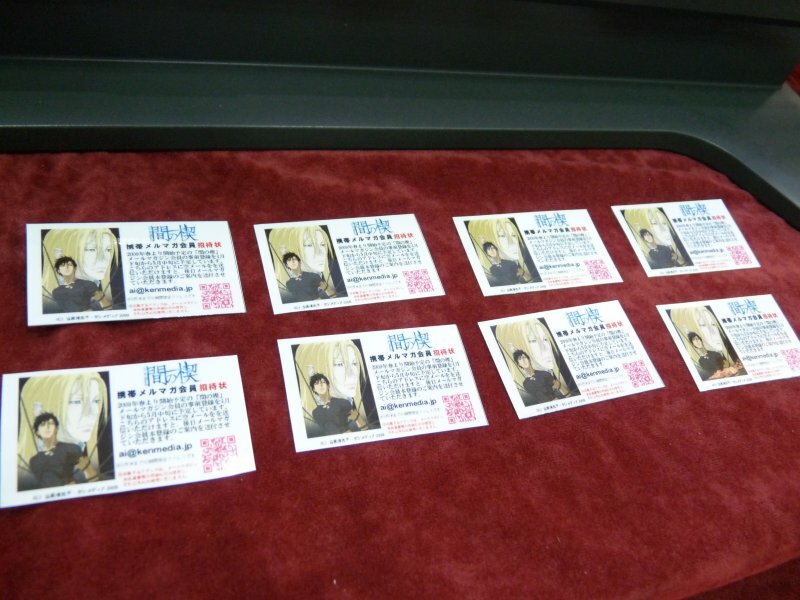 Leaflet of Natsu no Arashi! 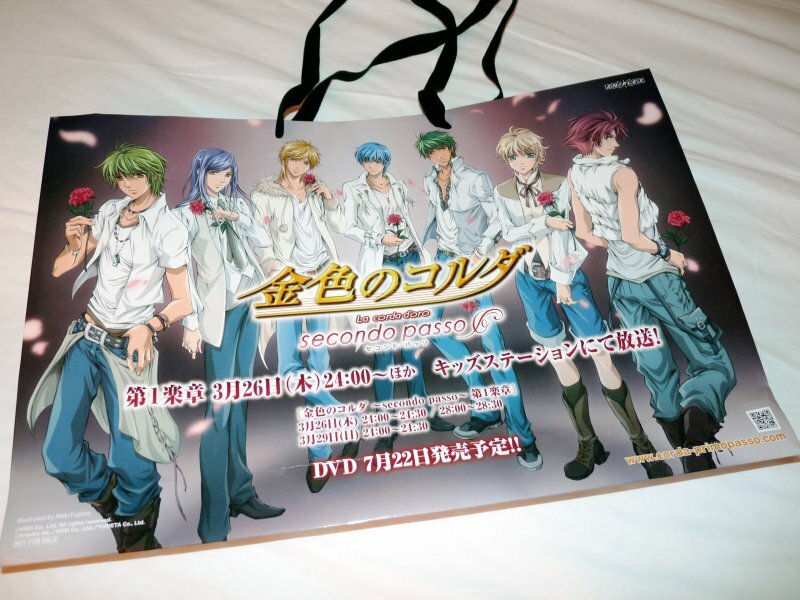 handed out at King Records booth. 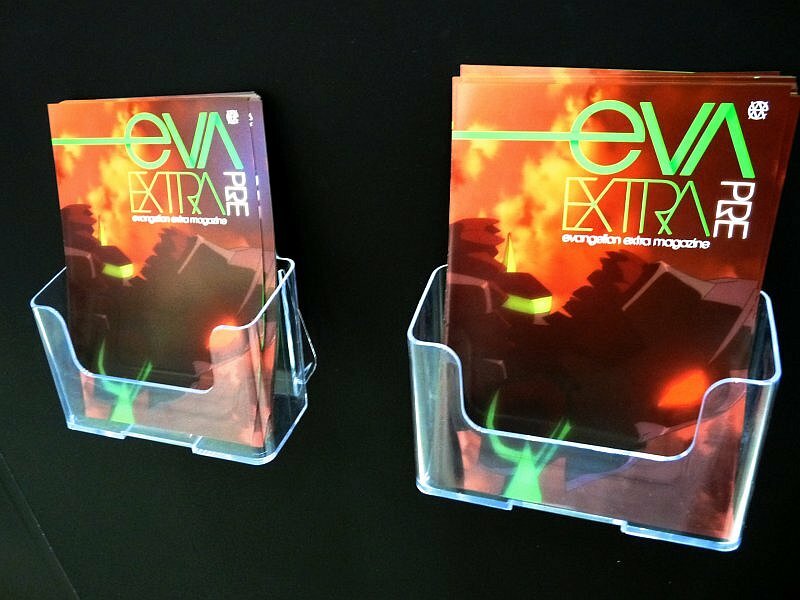 There were also flyers of Evangelion: 2.0 You Can (Not) Advance at the booth. 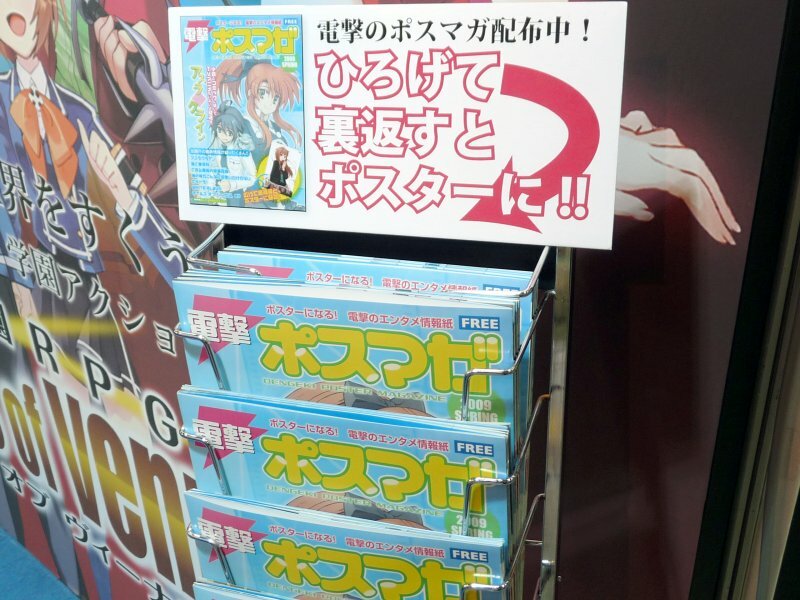 A booklet of Taisho Baseball Girls from Tokuma Shoten's booth, containing an exclusive novelette. 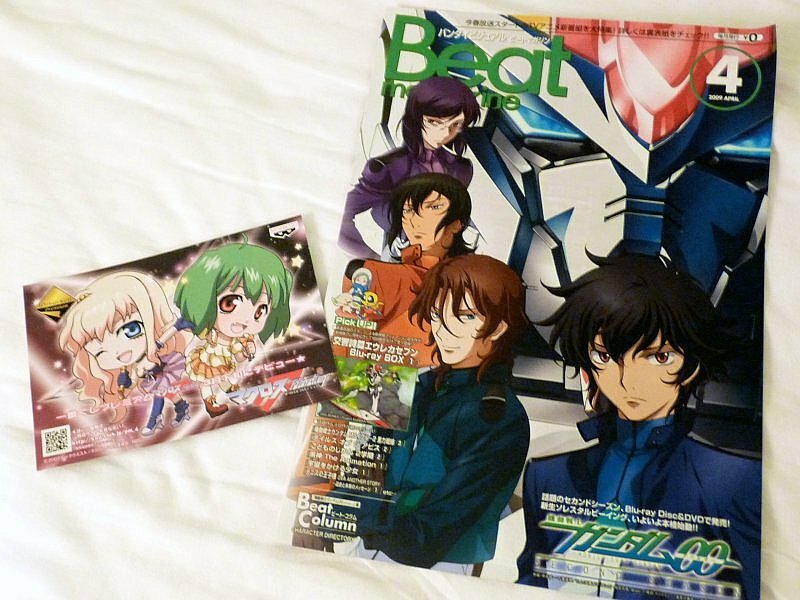 A postcard of Macross Frontier and April issue of Beat Magazine from Bandai Visual's booth. 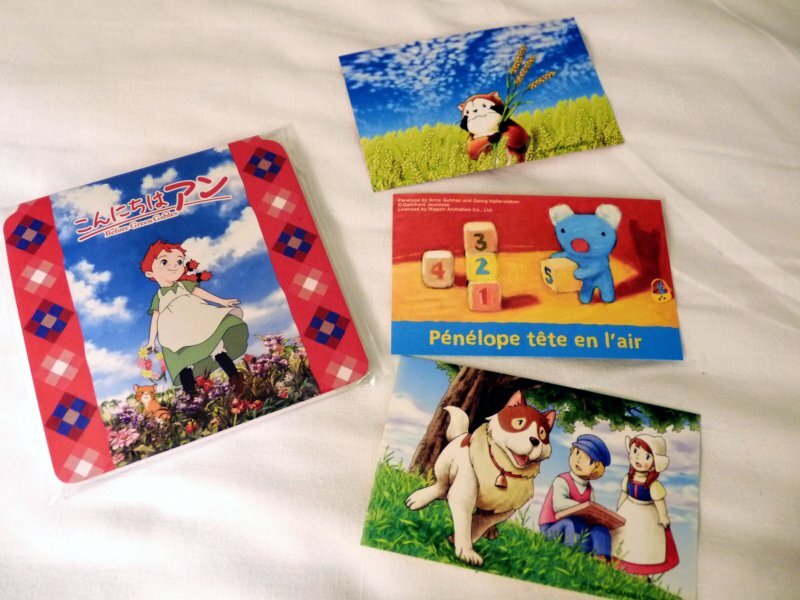 Original notepad of Before Green Gables and postcards from Nippon Animation's booth. 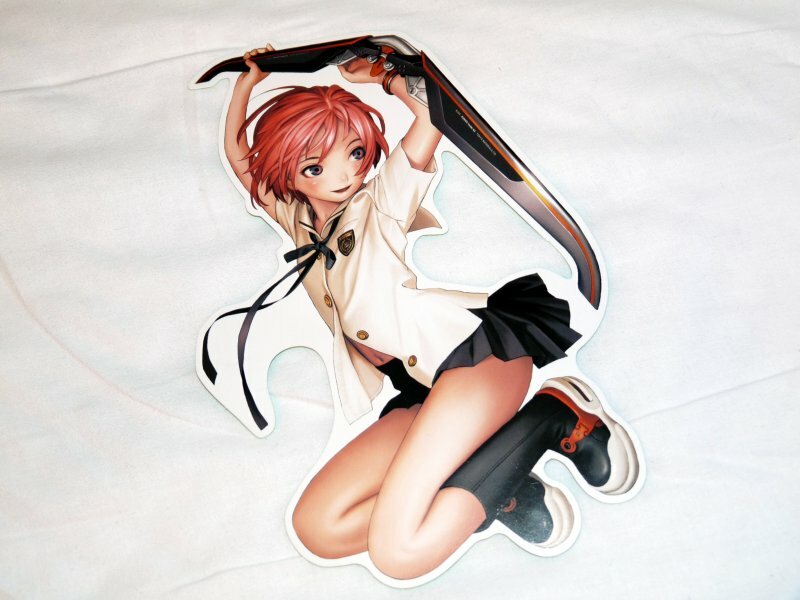 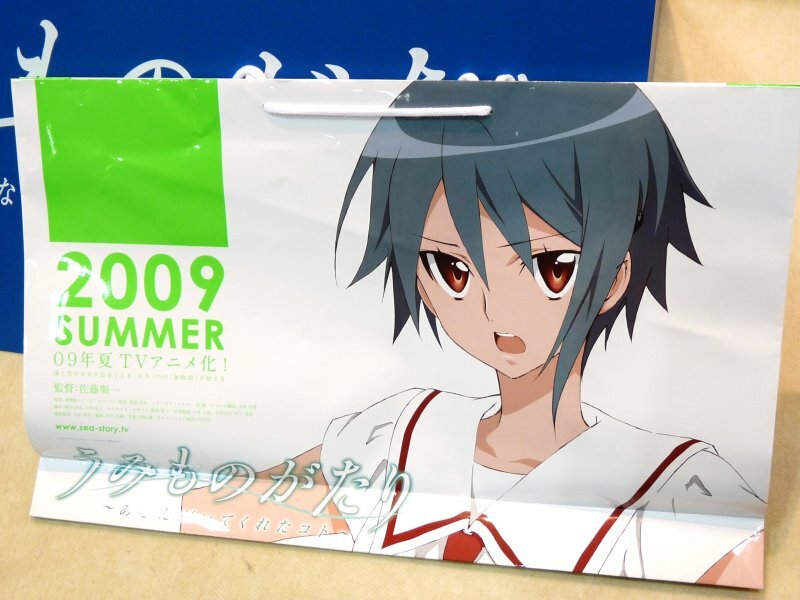 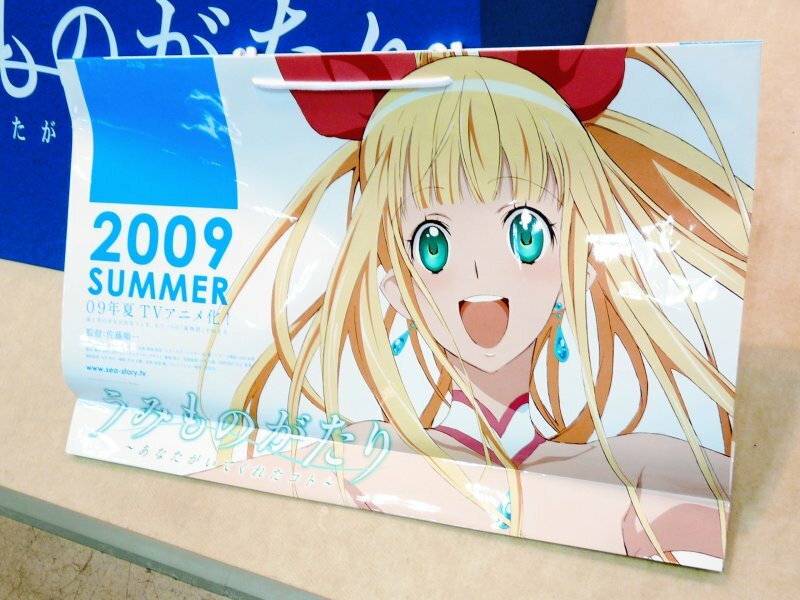 Japan Electronics College booth was giving away plastic folder featuring charcters designed by students. 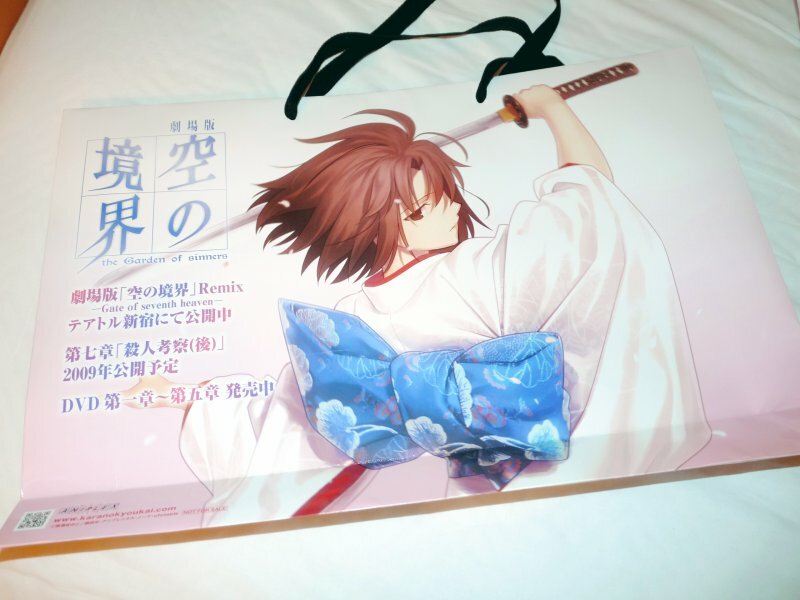 Business card of samurai-lord Date Masamune from Production I.G's booth. 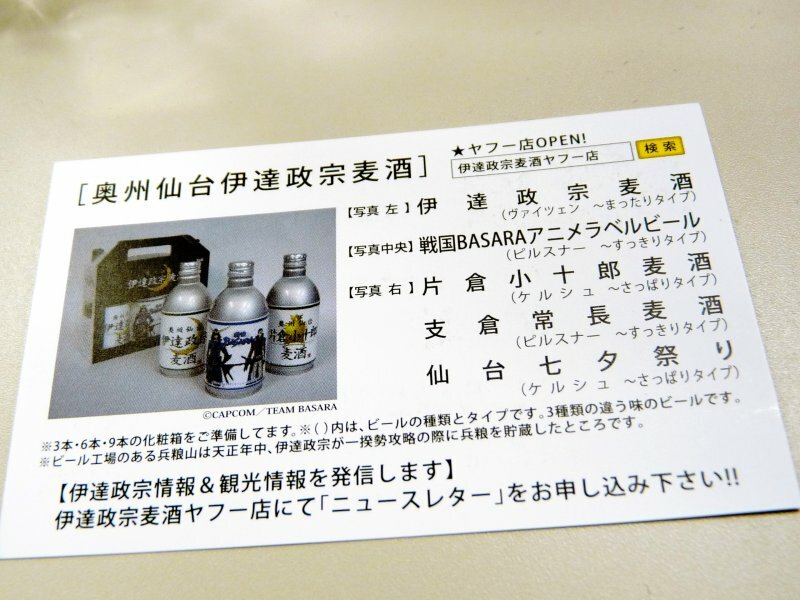 It was actually an ad card for beer. 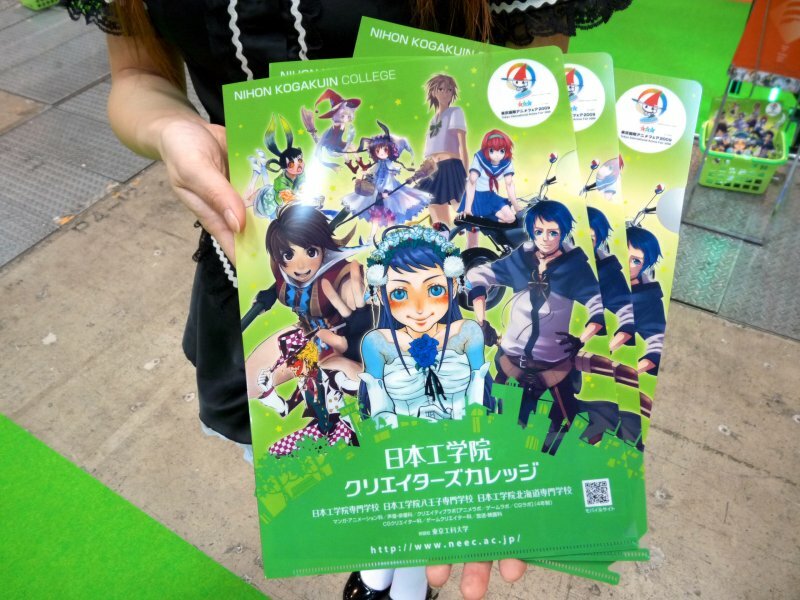 Nihon Kogakuin College's booth was also handing out folders. 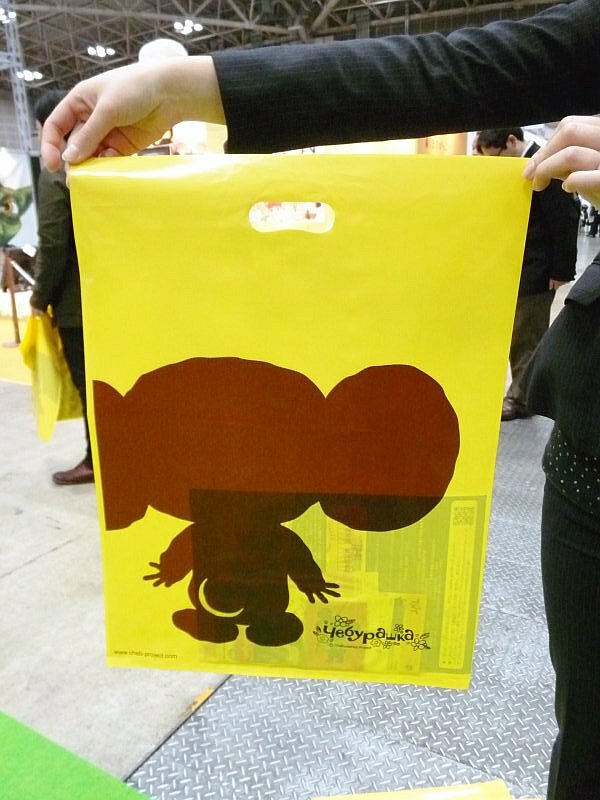 Cheburashka plastic bag from Frontier Works booth. 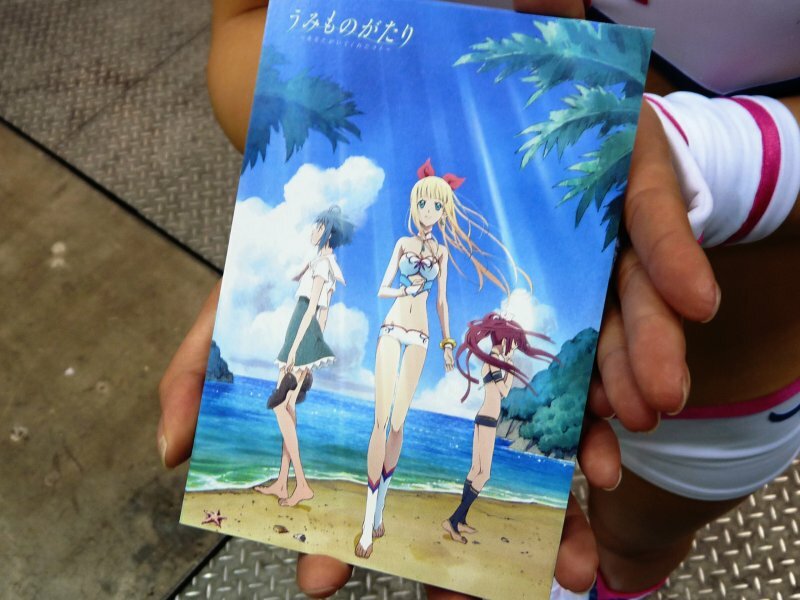 Postcard of Umi Monogatari (Sea Story) handed out at Shochiku booth. 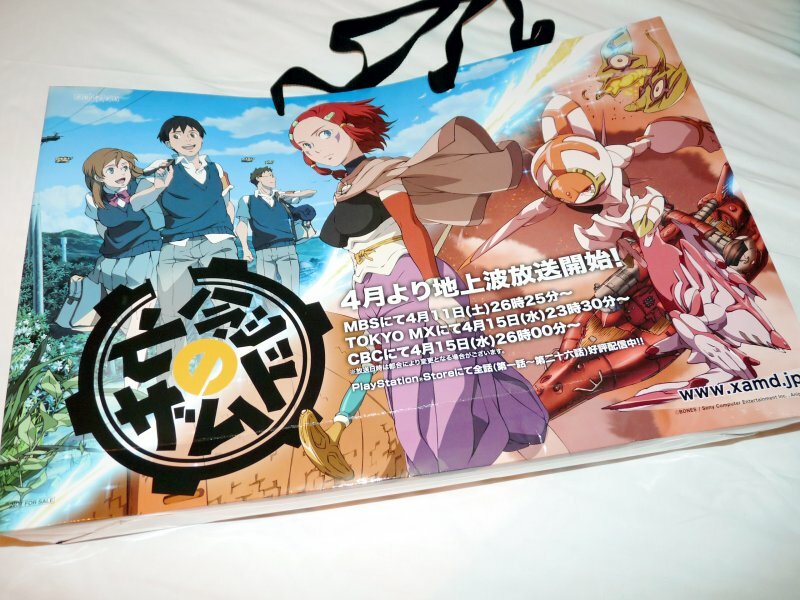 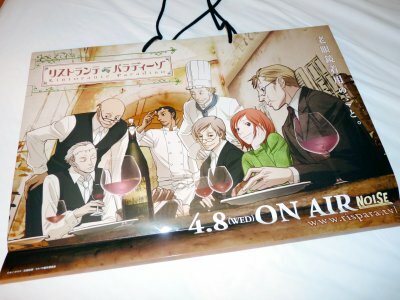 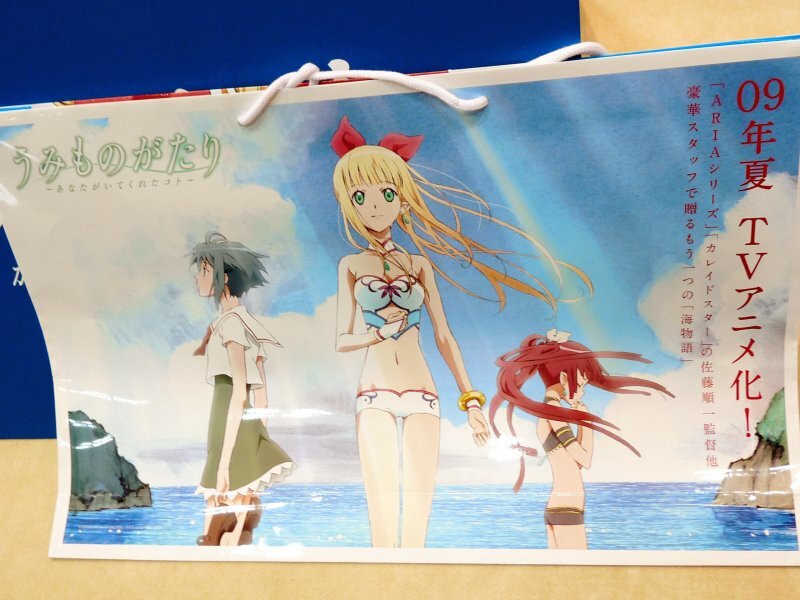 Paper bags featuring each of the three main characters. 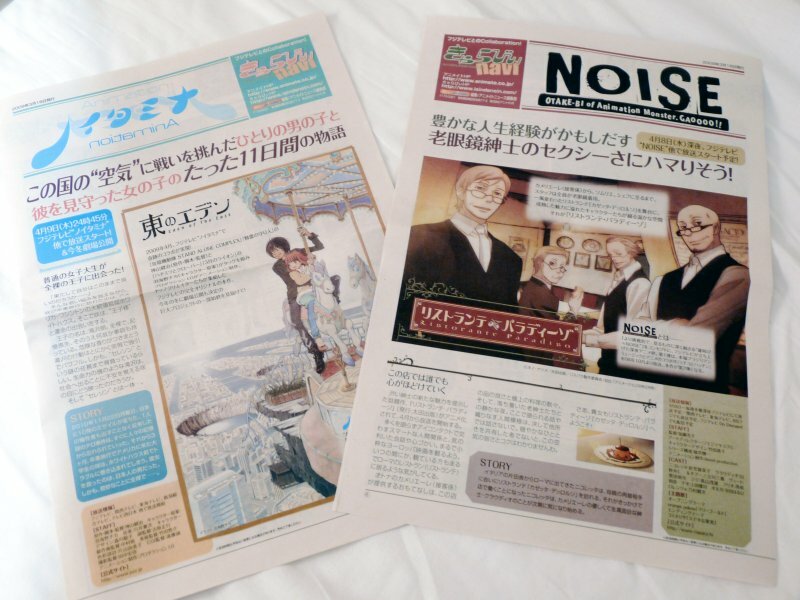 All three had same illustration on the flip side. 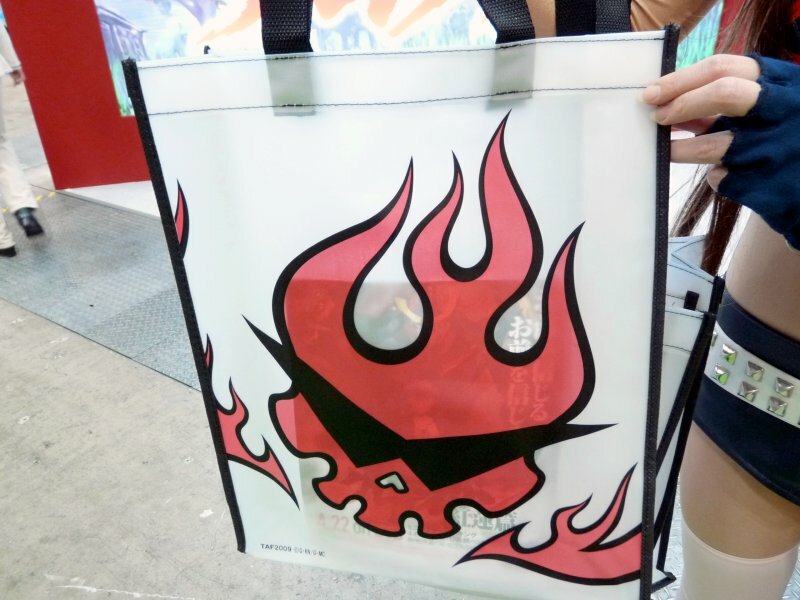 Plastic tote with the logo af Team Gurren from Tengen Toppa Gurren Lagann, handed out at Gainax booth. 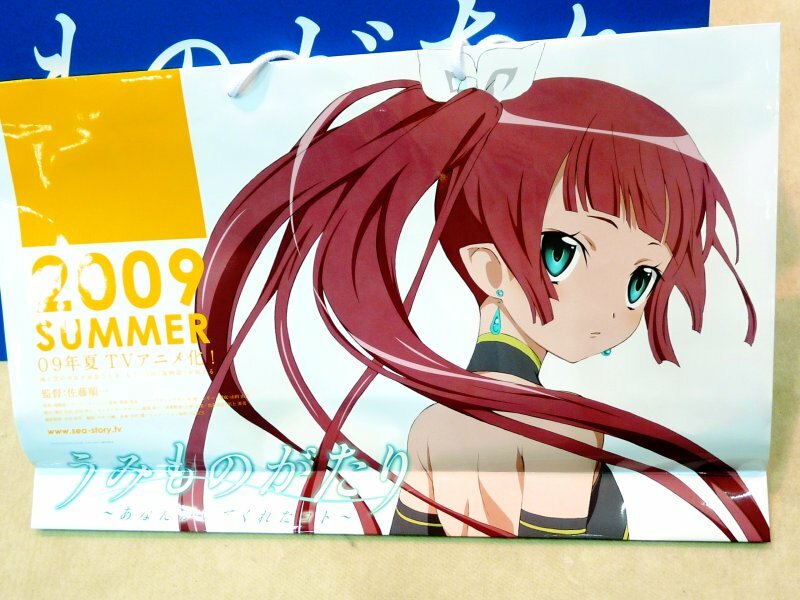 The following are paper bags from Aniplex booth. 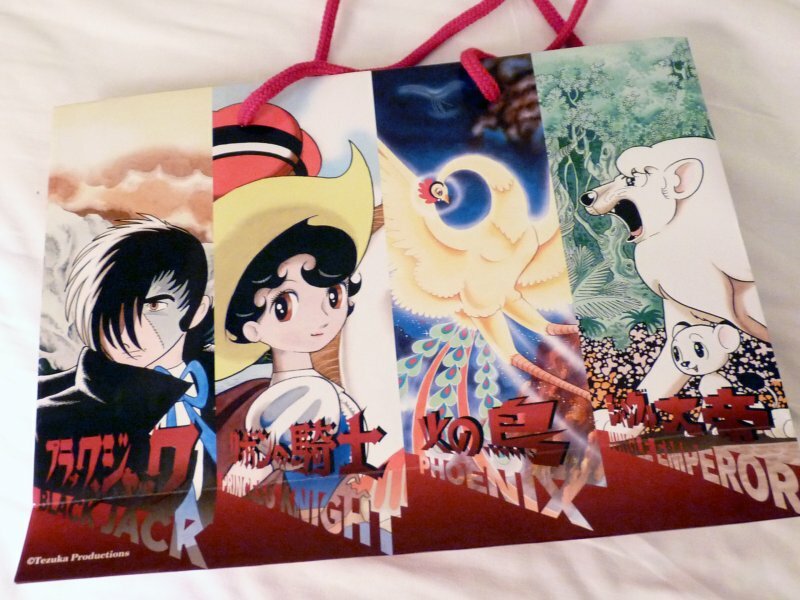 There were four kind, each featuring two animes. 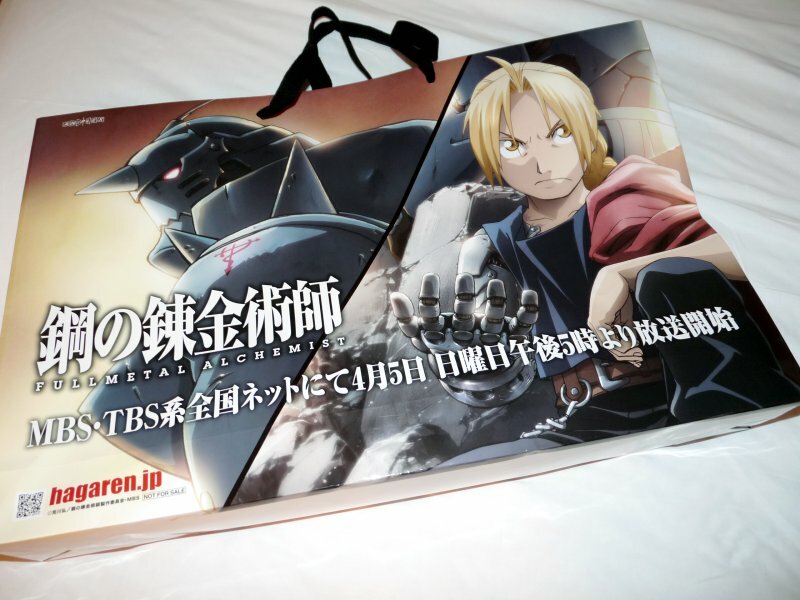 The bag featuring FULLMETAL ALCHEMIST and Xam'd: Lost Memories. 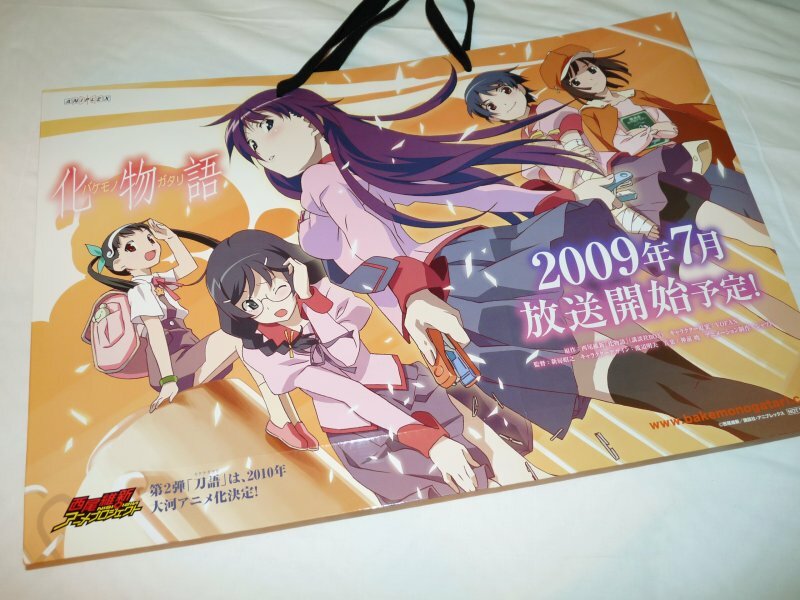 Bakemonogatari and Kara no Kyokai. 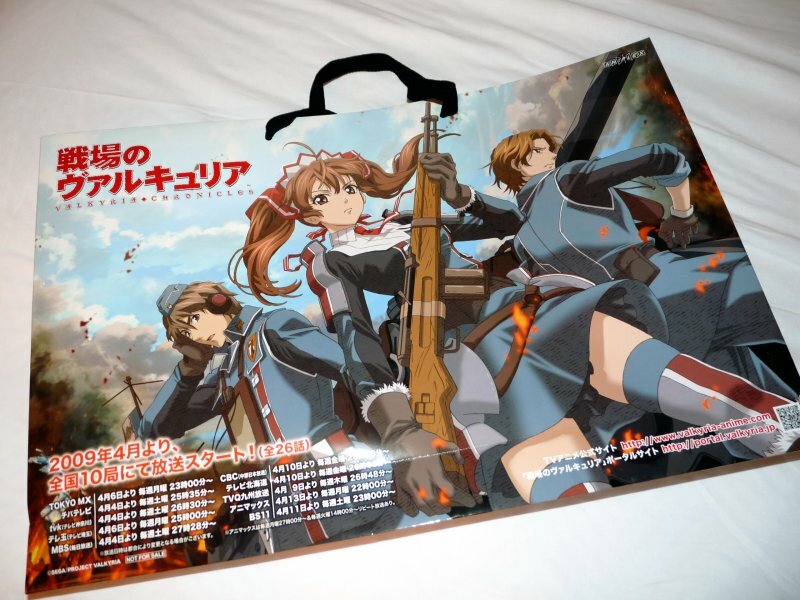 Valkyria Chronicles and Kin'iro no Corda. 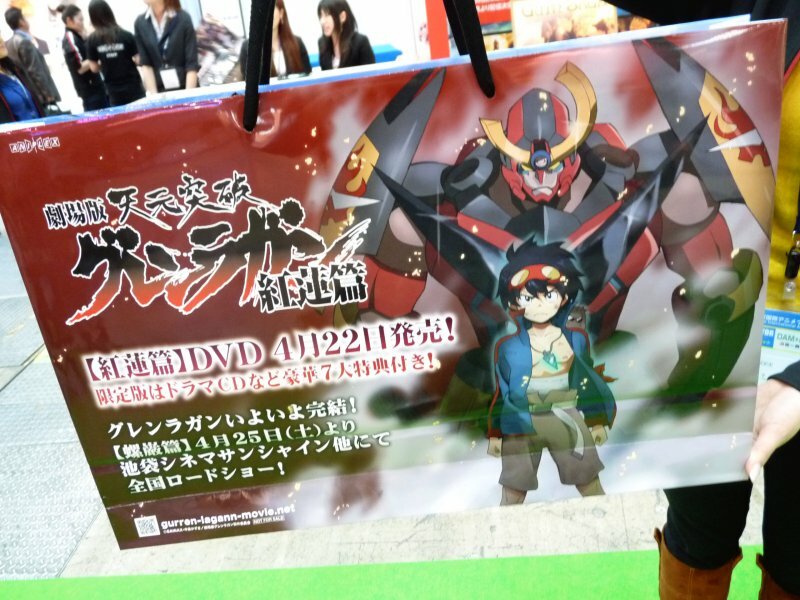 Guin Saga and Movie Version Tengen Toppa Gurren Lagann: Lagann Chapter. 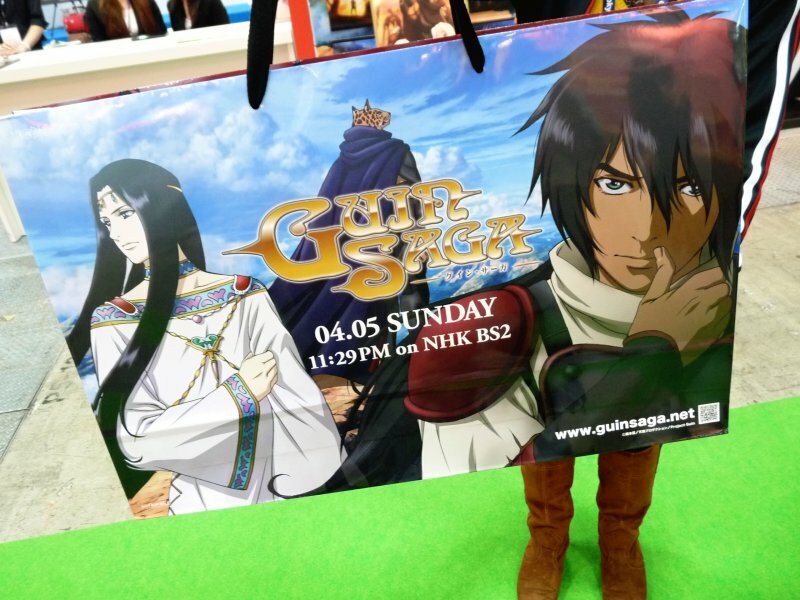 In case you've been wondering 'Why all these huge paper bags? 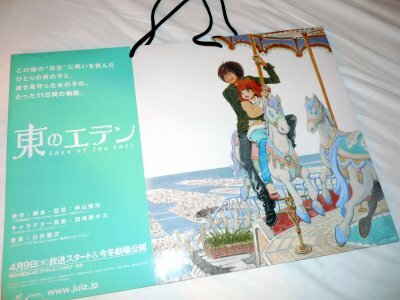 ', there are tons of pamphlets and stuff handed out at TAF so visitors will be in dire need of holdalls.